Often overlooked as a global travel hotspot, yet adored by those who are curious and adventurous enough to take the plunge, the Philippines really does stand out among other Asian countries, both in terms of its quantity and quality of unique selling points. Take, for example, the stunning picture-postcard rice fields of Banaue, or the gorgeous stone cobbled streets of the colonial city of Vigan - both important stops included in this seven-day itinerary. This trip also provides an insightful glimpse of the capital, Manila, as well as excursions to the cliffs of Sagada and tropical forests of Baguio. Along the way, it’s easy to become absorbed by the country’s rich 350-year history, with diverse art, architecture, cuisine, and languages all on display to provide constant reminders of the region’s European, American and Asian influences. The famous warm and friendly attitude of the proud Filipinos will inevitably rub off on you, as you're sure to end this trip with a big smile. The impossibly scenic Banaue mountainside rice terraces date from 2,000 years ago; explore them and meet the descendants of the tribespeople who created them. No reviews yet for this trip. Browse other reviews below for Remote Lands . After checking into your five-star luxury Shangri-La Makati hotel, you might want want to take a rest a prepare yourself for your full schedule of travel over the coming week. However, if your energy levels are quickly replenished, you’ll be itching to see exactly what this vibrant colonial city has to offer. To make the most of the evening, head to Manila Bay, where you’ll be able to catch the stunning sunset and sample some of the local Philippine cuisine. 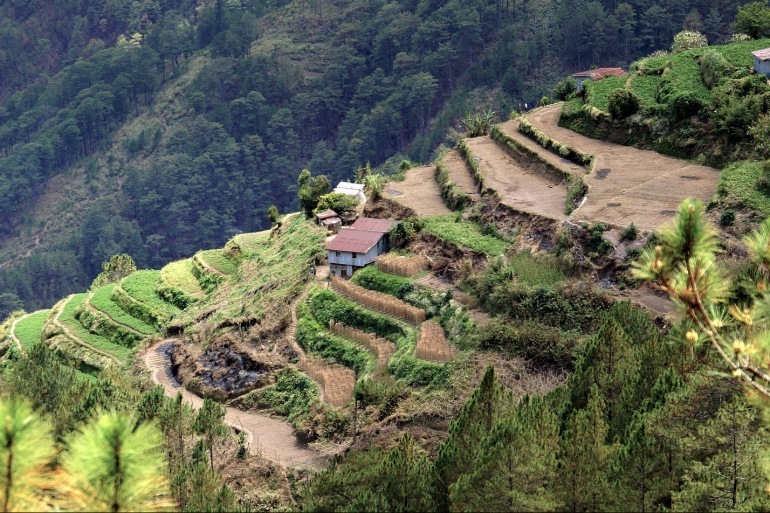 A drive from Manila to Banaue awaits you in the early morning. Although the journey is long, the developing landscape along the way is truly spectacular, and once you reach Banaue, a UNESCO World Heritage Site, you’ll realize it was all worth the effort. This mountain capital of northern Luzon is famed for its amazing, emerald-green, mud-walled rice terraces – some 49,000 acres of them - and you’ll have ample opportunity to explore (with your own personal tour guide) once you’ve arrived. This morning, you’re off to visit a local family of Ifugao villagers - a great opportunity to learn about the local agricultural practises and traditional way of life. After this stop-off, your guide will take you back up above the terraces to reveal some breathtaking views. A short afternoon drive takes you to Sagada, where you’ll have the chance to explore the majestic Bomod-ok and Bokong Waterfalls, with the highest point at over 200 feet! Don’t feel guilty about going for second helpings at your breakfast buffet this morning - today you’re going to need all the energy you can get! Your first stop of the day is the Hanging Coffins of Sagada; famous not only for its beauty, but also its 2,000-year-old ritual of hanging homemade coffins from the limestone cliffs high above the ground (corpses and all). You’ll have the chance to hike up the cliffs for a birds’-eye view. Afternoon activities include an incredible white-water rafting trip on the Upper Chico River. A morning car journey will take you from Sagada the official summer capital of the Philippines - Baguio. After checking in to your luxury hotel, the Manor at Camp John Hay, it’s time to check out the local scenery and lush tropical landscape of the surrounding Kabadjo Forest, all from atop a horse! There is also the famous Baguio Flower Festival and several interesting museums, which are worth a visit in the afternoon. it earned its place on UNESCO’s prestigious list of World Heritage Sites. The many sites you’ll visit reflect the area’s diverse background, with obvious architectural, culinary and linguistic influences stemming from the Filipino, Spanish and Chinese occupations. After you’ve enjoyed a leisurely breakfast and checked-out of the charming Sitio Remedios Hotel in Vigan City, you will - perhaps a little reluctantly - start your journey home. A quick 40-minute drive takes you to Laoag International airport. From there, it’s onto another commercial flight back to Manila, you’ll connect to your international flight home or to your next exciting destination. Bon voyage!